In an attempt to reinvigorate interest in the University’s museum collections, Research Professor of Earth and Environmental Sciences Ellen Thomas, Chair of Biology Ann Campbell Burke, Yu Kai Tan ’20, and Andy Tan ’21 have put up an exhibition entitled “The Tree of Life” in the Science Library (SciLi) and have added feet to the University’s Glyptodon. One of the new exhibits from the recovered University collections resides in Exley, showcasing a current interpretation of the Tree of Life, as contrasted with a depiction of the Tree of Life dating from the 19th century. While the old interpretation of the Tree of Life placed people—namely “man”—at the apex, the University’s reinterpretation of the Tree of Life places humans and animals in only a small portion of the tree, while bacteria comprises much of the tree’s diversity. In addition to the two posters, the exhibit contains many specimens from the museum’s collection that provide more concrete representations of parts of the tree. 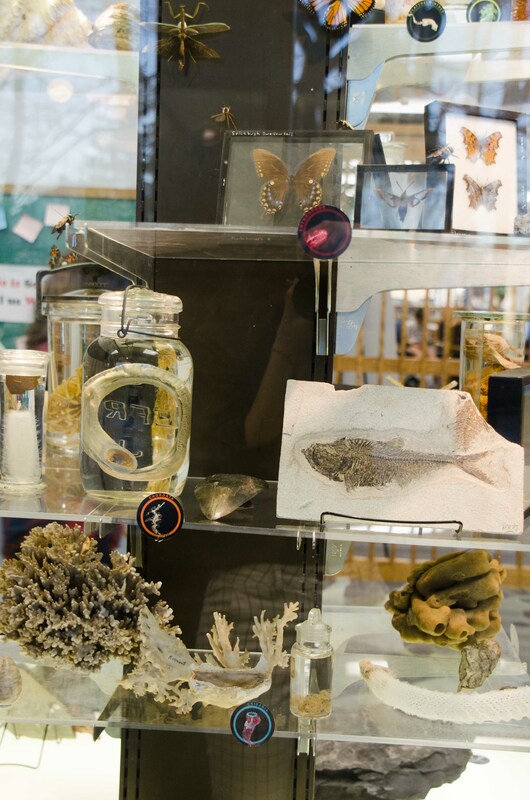 Included in the display are butterfly species, stuffed birds, and specimens preserved in alcohol. One of the jars with preserved specimens holds snake embryos. The soft tissue of the embryos is cleared, while the bones are stained red and the cartilage is stained blue so the skeletal structure of the specimen is visible, while maintaining its shape and structure. 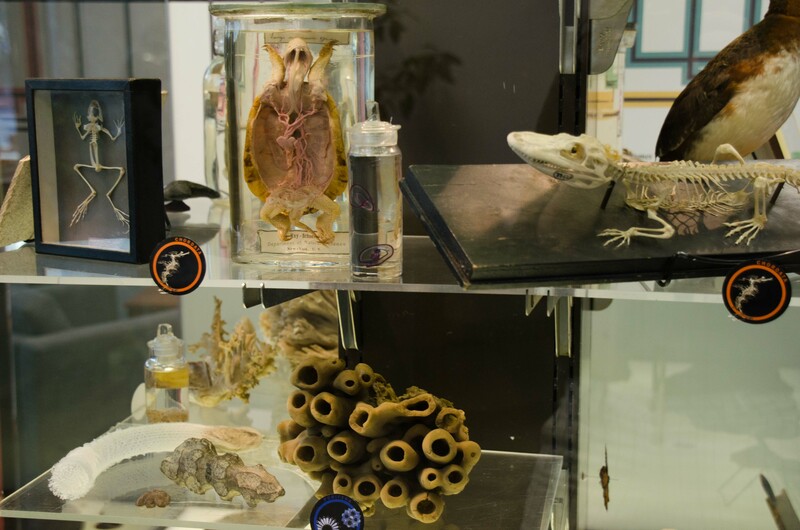 Due to the display’s relatively limited space, Y. K. Tan and A. Tan will add more information about the various specimens and the exhibition as a whole through a story map, which will be available through a QR code. The exhibition itself will be up until the end of the semester, and before the end of the calendar year, the curators hope to install a complementary exhibition in Olin Library on the visualization techniques involved in portraying the Tree of Life throughout history. The curators also added feet to the Glyptodon that stands outside SciLi. The original Glyptodon, as it stood in the University’s Orange Judd Museum, which closed in 1957, only had one foot, but Thomas ordered four feet casts in April 2018 to complete the Glyptodon. A. Tan and Y. K. Tan spray-painted these casts to fit the rest of the body during last semester, and they were installed on Jan. 28. With the addition of the legs, the Glyptodon is complete, but the curators hope to add an armadillo skeleton next to the Glyptodon for a size comparison. The next exhibition to be displayed will be a deinotherium skull cast. The deinotherium—a relative of the modern-day elephant—was found in the penthouse of Exley and taken out of storage last summer. Over the past semester, A. Tan and Y. K. Tan completed most of the cast painting, looking over old museum photos in order to restore the cast to its previous condition. The curators enlisted the help of Instrument Maker Specialist Bruce Strickland and Research Assistant/Lab Manager for the Earth and Environmental Sciences Department Jim Zareski. Strickland built the support structures for the skull in the machine shop, and Zareski built the base for the support structures, modeled after his work on the Glyptodon base. The curators hope to display the skull cast in a month. The curators hope to recruit more students from a variety of disciplines beyond the sciences to continue developing exhibitions.